Ahh, eggs. I swear I could eat them everyday. And I almost do. Until recently, I wouldn’t eat any egg that had even a hint of a runny yolk. As in no over-easy eggs, no “dippy” eggs (aka sunny side up), no eggs Benedict. Then all of a sudden, I became obsessed with vegetarian eggs Benedicts. So now, I’m no longer grossed out. Well, I am a little. But I’m getting over it quickly. Because of this new revelation, I am now suddenly even more drawn to eggs than ever because now I have so many more options (how many times can you eat fried, scrambled, or deviled eggs?)! 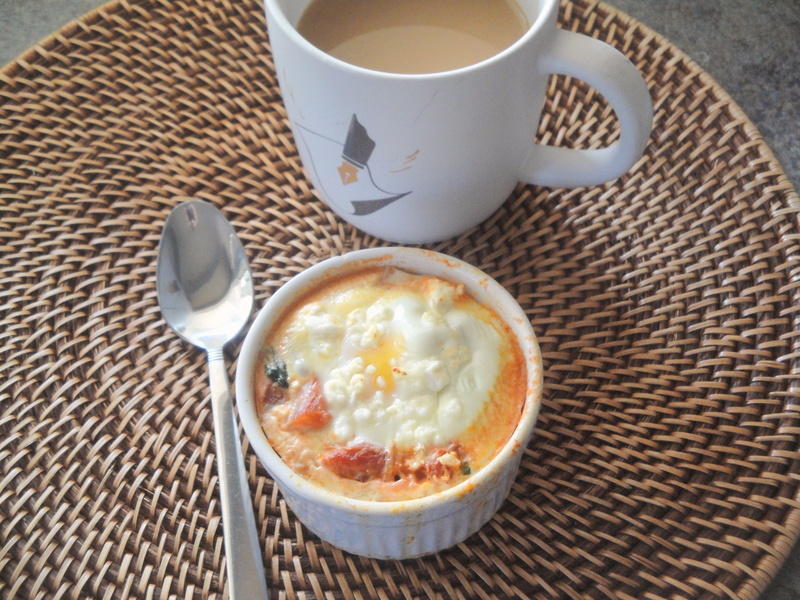 These Baked Eggs with Spinach and Tomato are slightly dippy in the middle but filled with tons of other flavors making this a not-so-standard breakfast. 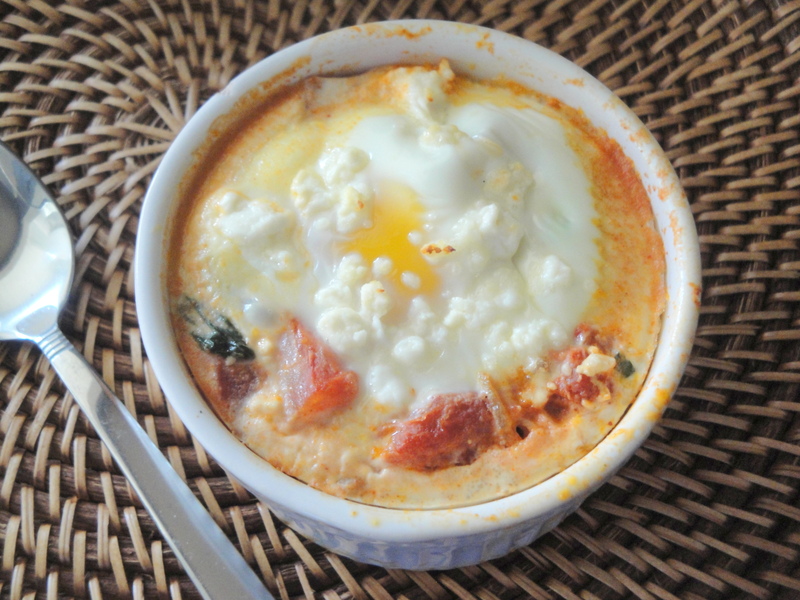 Onions, spinach and tomatoes are mixed together with spices before being spooned into ramekins, topped with a fresh egg and feta cheese and baked. This dish is filled with flavor and puts plain old scrambled eggs to shame. 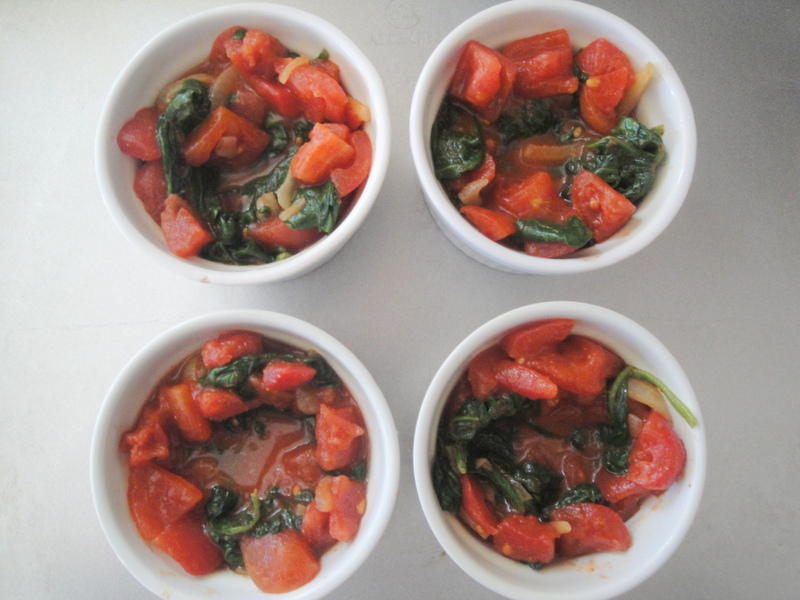 Serve this with a side salad and you could have this for lunch or dinner. I left mine in the oven a little longer than the recipe said but not because of the runny yolk, but because I wasn’t sure if the whites were cooked fully. I haven’t quite mastered the “baking” of eggs yet so I never quite do it right. But this is a really fantastic alternative to eggs which would be festive for a holiday breakfast one day this week. Preheat oven to 400 degrees F. Meanwhile, in a medium saucepan, heat oil over medium-high heat. Add onion and sauté until soft, about 5 minutes. 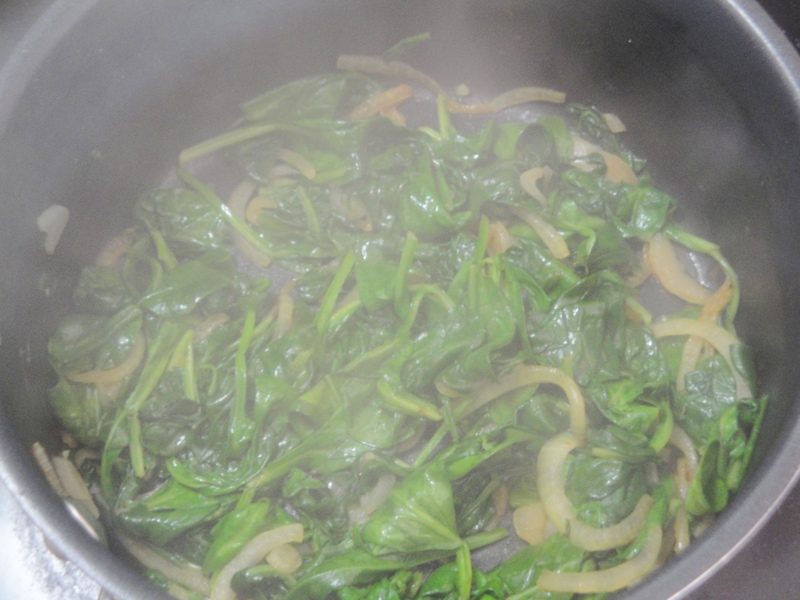 Add spinach and sauté until just wilted, about 2 minutes. Remove from heat. 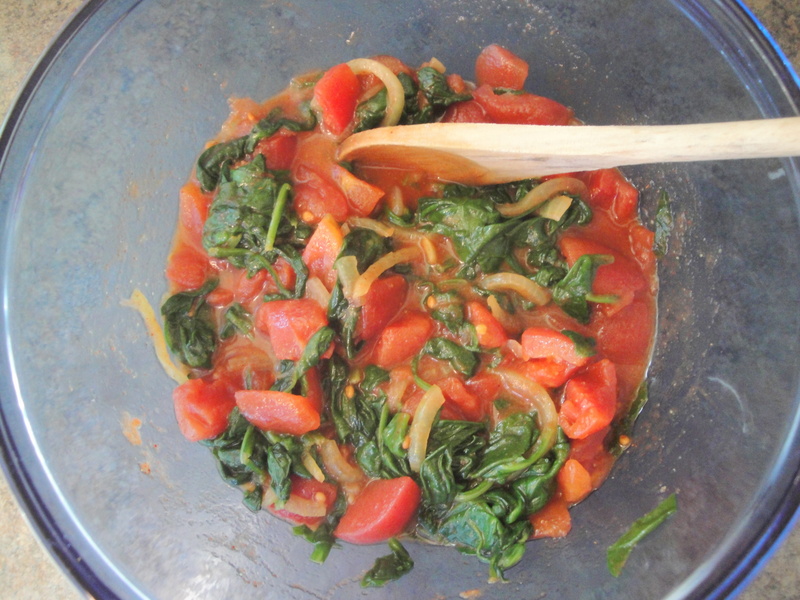 In a medium bowl, stir together tomatoes, cumin, salt, pepper, paprika, and, if desired, hot sauce. 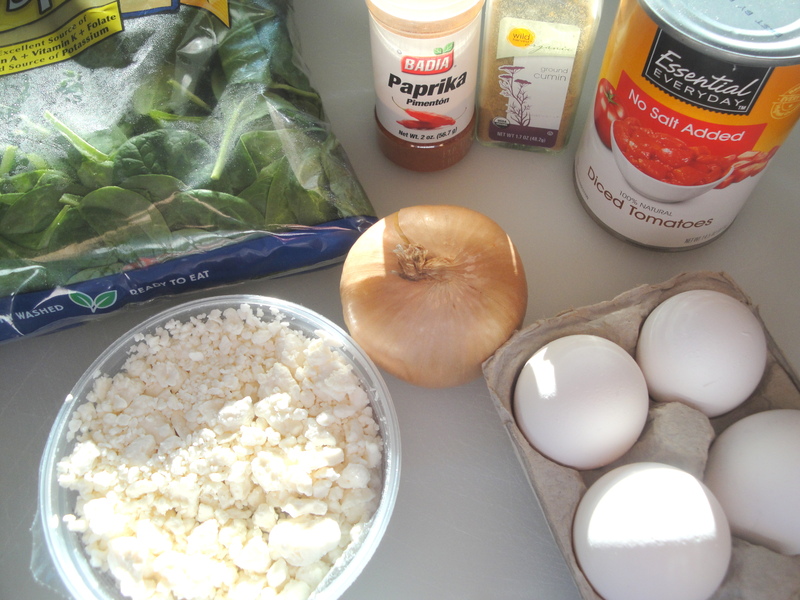 Add onion-spinach mixture and stir to combine. Divide among 4 oiled 10-ounce ramekins. 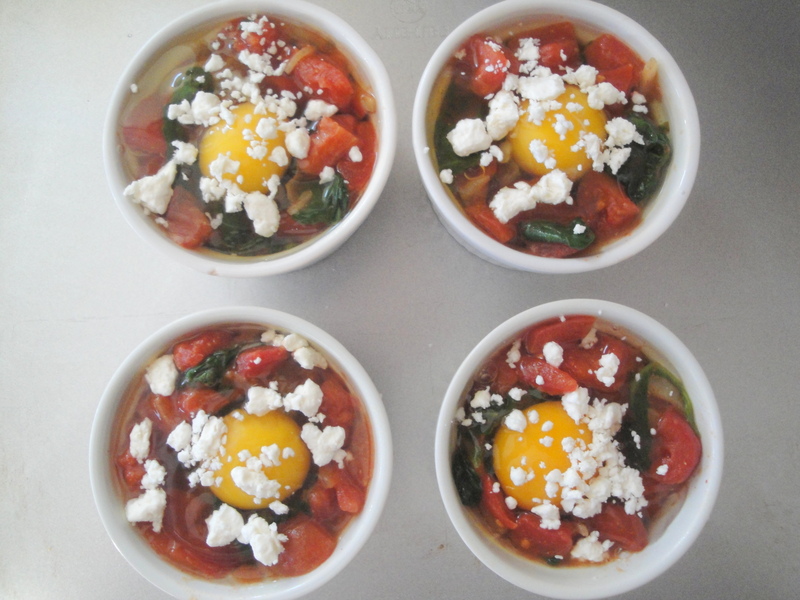 Crack an egg into the center of each ramekin, then sprinkle on feta. Bake until whites are set but yolks remain soft, 12 to 15 minutes.